The boys are away this weekend, so the girls are getting together to play! Girls Night is the best - good food, lots of wine, silly chatter and usually some sort of prime entertainment like Best of Friends. Another great thing about getting together with the girls is that we can bring healthier snacks and not worry about any complaints from the boys. 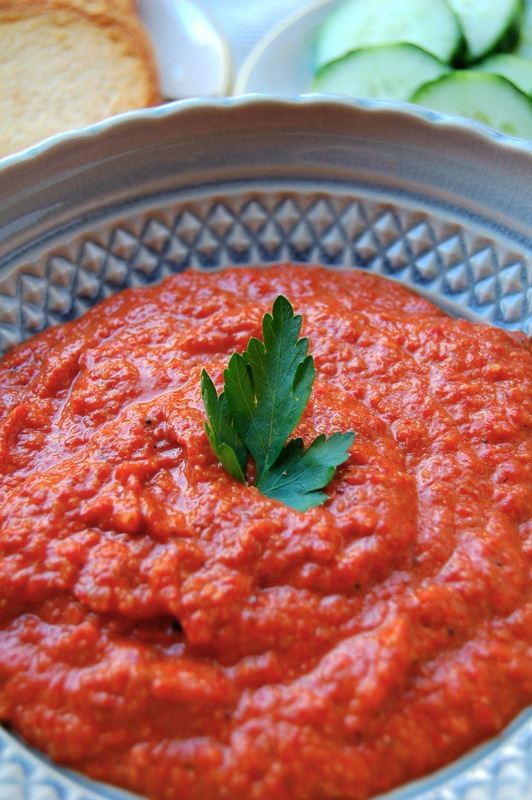 My favorite, and go to appy to bring is a Roasted Red Pepper dip with walnuts. I am actually amazed it has taken me so long to get this on the blog. Since it is one of my favorite things to eat, it is perfect to add to the Top 30 Countdown as #27. Back when I was watching a lot of the Food Network, I once was slightly obsessed with Ellie Krieger, one of the Networks personalities who focused on healthy eating and cooking. I have a few of her cookbooks, one of which included a Walnut and Roasted Red Pepper Dip. I made it one afternoon when I was visiting my Mom and we fell in love! Over the years, I have made a few changes to the original recipe to simplify. The original recipe calls for pomegranate molasses, or making your own from pomegranate juice. We usually don't have pomegranate juice or molasses in our pantry, so I tried honey instead. I also prefer to roast my own peppers, it is one of my favorite things to do in the kitchen for some odd reason! I included the measurement of jarred roasted red peppers too in case you are in a time crunch. Hint for tomorrow...it's a winner! Serve with crackers, cucumber slices, vegetable platter or roasted artichoke leaves! If roasting your own peppers, follow the directions on my previous blog post. Toast the walnuts in a dry small skillet over medium heat until fragrant, about 2 minutes. Watch this closely as they will burn fast. Remove from the pan and set aside. Toast the slice of bread until dry and very firm, then add to a food processor and mix until you have bread crumbs. Add the walnuts and process until finely ground. Add in the honey, lemon juice, peppers, cayenne and cumin and process until smooth. With the processor running, add in the olive oil in a thin stream. Season with salt and additional honey if needed. The dip is best served with crackers, vegetables or cucumber slices.